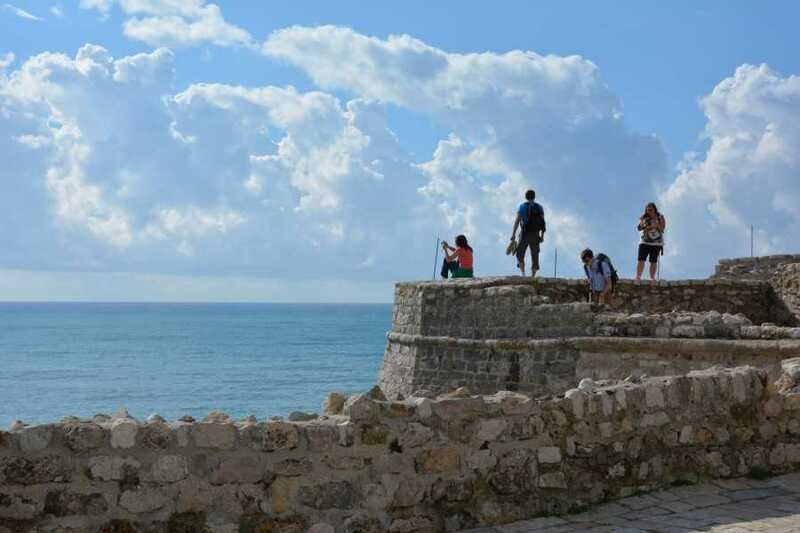 If you want to explore the south of Montenegrin coast with a spectacular sandy beach in Ulcinj, 13 km long and 60 meters wide, make sure to go to this tour. In addition to seeing a beautiful large beach, you will see the largest olive grove in Montenegro under the name Valdanos, as well as the cities of Bar and Ulcinj. Just like the Bay of Kotor is completely different from the Budva Riviera, also the southern part of the Montenegrin coast is a completely different experience. All of this will make the tour interesting and dynamic in its sightseenig, culture and historical heritage. This tour is organized by MH Travel which in its former itinerary had a tour around the Skadar Lake with the mountain Rumija from where you can have an excellent view of Albania. Although this tour was the favorite among guests, we thought that guests spent too much time in a vehicle. In the former itinerary we did not visit the Great Beach in Ulcinj, because there was not enough time for it. Then we decided to interview guests and most of them said they would rather see the Great Beach instead of Mount Rumija so we changed the itinerary. If you are accommodated in Budva or Kotor and want to visit this part of Montenegro, MH Travel is an ideal solution. Not only because you will see the old town of Bar, the only old town in Montenegro that has no inhabitants, as well as the port of Bar, you will also see the former pirate city of Ulcinj with its Albanian culture, while the Great Beach, unlike similar beaches in Albania, is not under construction and reminiscent of the beaches that are scattered by the ocean. Relaxation on this beach is strongly recommended and therefore we do not doubt that you will choose this tour with which you will spend another unforgettable day in Montenegro. Breakfast break and 60 minutes of sightseeing. We start next to the old town of Kotor and then we will pick up the guests next to the old town Budva and after an hour's drive we will reach the city of Bar, which has the largest marina in Montenegro with a beautiful promenade where King Nikola's mansion is located as well as numerous restaurants and cafes. Here we will make a break for breakfast. Port of Bar is the biggest port in Montenegro, but its organization is such that it is not overloaded with large cargo or ferry or cruise ships. This gives a special charm to the harbor and makes her marina the most popular part of Bar among its inhabitants. Guests who do not want breakfast can walk along the promenade and enjoy the city beach. After the break, we will drive to the Old Town of Bar. Unlike the rest of the old towns on the Montenegrin coastline that are settled by the sea, the Old Town of Bar is positioned 5km from the sea and today has no inhabitants. The hill encircled by the walled town was settled in prehistoric and Illyrian times but was abandoned during the Roman era when it was moved to the coast, to the same location where modern Bar stands today. Next stop will be city of Ulcinj. We will first pass next to Old Olive Tree, which is located near the main road.The old olive tree has 2 millenniums and it is one of the oldest olive trees in Europe. We will make a photo stop and continue towards Ulcinj. The inhabitants of Bar and Ulcinj have traditionally been involved in the production of olive oil. That is why this region is famous for the largest olive forest in Montenegro named Valdanos with more than 100 000 olive trees. Ulcinj is the southernmost town on the Montenegrin coast which has a distinguishing Oriental flavor and feel to it, partly because of the long Ottoman presence here (till 1878) and more due to the fact that this is the only coastal town with a Muslim Albanian majority. This makes Albanian the first language here and most of the signs are bilingual. The old Town of Ulcinj is smaller than old towns of Kotor, Budva, Bar and Herceg Novi. It is settled on the top of a huge cliff just above the sea near the city center. After visiting the old town of Ulcinj, we will go to the Grand Beach and only a few kilometers away from the city center where we will make a lunch break.The road south of the town leads across the Milena Canal (named after King Nikola’s wife) leading to the vast Ulcinj saltpans. On the canal one can see kalimere, traditional fishing devices with the net on the end of long pole designed to catch fish. From this point the long Great Beach (Velika plaža) stretches, with the length of 14 km of fine gray sand it is the largest beach in Montenegro. The Great Beach is the ideal place for a first-class exeprience at the end of this tour. Guests can enjoy the extraordinary dishes, especially fish because restaurants often have equally represented sea fish as well as fish from Lake Skadar as well as fish from Bojana River (the southernmost river in Montenegro). Numerous farmers from surrounding villages supply restaurants so the taste of vegetables, fruits, meat, fish, cheese, olive oil and wine is organic with a lots of favor and prices are very favorable. Guests who do not want to have lunch can enjoy the Grand Beach or swim in the sea or simply sunbathe while enjoying the sound of the waves. So relaxed and full of new experiences, we will return to Budva and Kotor. In the subsection we will enjoy the whole way in the magnificent sunset, while in the high season we will reach major traffic jams on the highway. NOTE:Guests who want to bring their luggage on the tour and finish the tour in another city ( Kotor or Budva) can easily do that. There is no luggage fee.